After climbing Mt Batur we went back to Ubud for a few days during which Carrie got sick. While there we stayed at the same hote as Angie, our new Scottish friend who we met at Batur. She wound up coming with us when Carrie felt better and we headed south to Kuta, the resort town and party capital of Bali. Out transport this time: a rental car for $9 a day (too bad we didn’t come up with this money-saving idea earlier). Imagine everything I wrote about Phuket last time but in a much smaller area. The streets are lined with shops and young people, many of which are Australian, walk around drinking beer at all hours of the day. It’s a party atmosphere 24/7, though we tried to go out one night and found that there was not much doing. My favorite part, though it irritated me sometimes, was walking the gauntlet of shopkeepers on the side streets. Every single one would try and get me to come in and look at and buy their goods ranging from stickers to teeshirts, beer coozies, statues, hats, sunglasses, nick nacks and more. 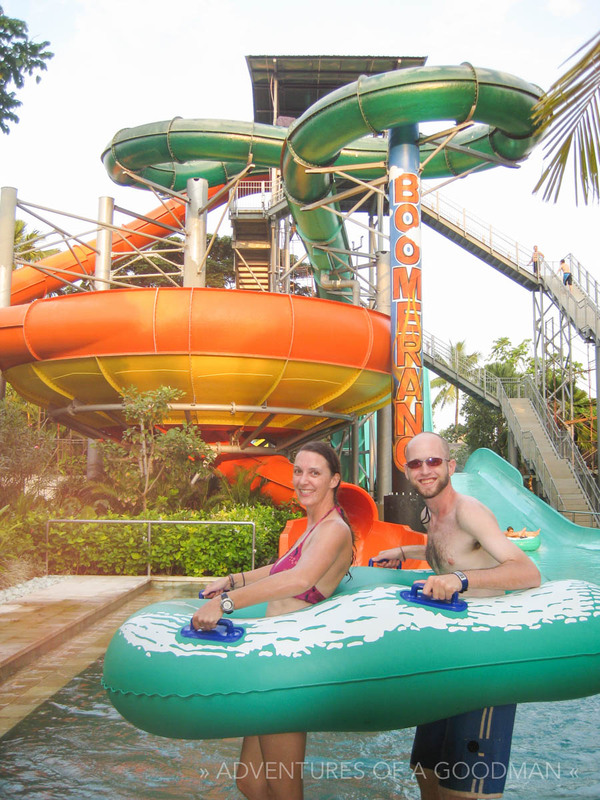 When not walking or avoiding the gauntlet, our other big activity in Kuta was the Waterbom water park. For six hours the three of us slid and tubed our way through 16 different slides and down the lazy river. Typical us, we were amongst the final people to leave the park.